JEE Main is one of the toughest competitive exams for engineering in India. Every year, around 15-16 lakhs engineering aspirants appear for the JEE Main in the hopes to get into some of the top engineering colleges of the country. In this era of cut-throat competition - Being intelligent or Dedicated alone might not be enough. You need to be smart and hardworking. 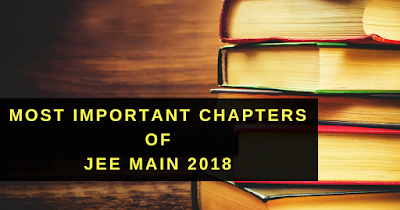 Prepare these chapters of Physics, Mathematics & Chemistry to crack the JEE Main 2018 examination.